Some participants during the hand over ceremony of 30 rehabilitated and new water facilities in two LGAs, Lagos, recently. 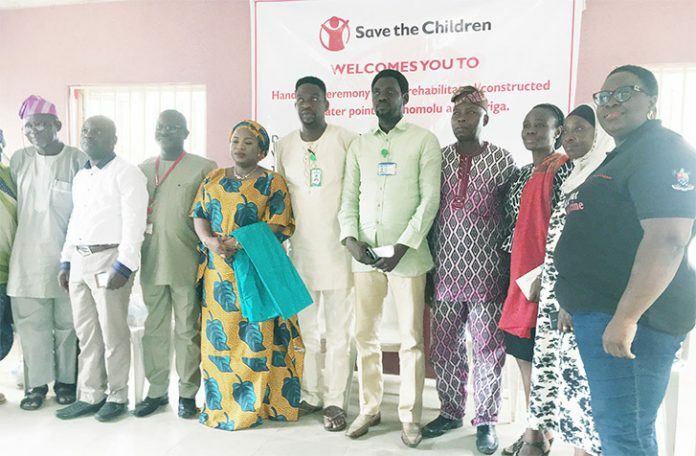 To reduce high incidence of diarrhoea among children under five years, Save The Children International has handed over 30 rehabilitated and newly constructed water facilities to two Local Government Areas in Lagos, under its Stop Diarrhoea Initiative (SDI). At the handover ceremony to both Shomolu Local Government Area (LGA) and Bariga Local Council Development Area (LCDA) of Lagos recently, Save The Children said the aim is to reduce at least 50 per cent diarrhoea incidence among children under five years. Mr. Godfrey Iloha, the WASH Advisor of The Stop Diarrhoea Intitiative (SDI) explained that it is part of the SDI’s Water Sanitation and Hygiene (WASH) implementation strategy to deliver community wide sanitation in Shomolu LGA, and ultimately increase access to improved sanitation. Iloha also said that the project was designed mainly to stop early death of children under the age of five and reduce childhood illnesses in Shomolu. He said, “We found out that in Shomolu that there are children with diarrhoea and that is why we decided to bring this project to Shomolu LGA and Bariga LCDA. According to him, the activities were conducted in coordination with the leadership of Somolu Local Government Area, Bariga Local Council Development Area and the various community structures. These include, Community Development Associations (CDAs), Community Development Committee (CDC) and the Water Sanitation and Hygiene Committee (WASHCOM), he added. This was done to enhance ownership and sustainability of the SDI project. Upon the completion of the project, these facilities are now ready for hand over to the communities with trained technical committee members from the communities who will be responsible for their maintenance, Iloha further explained. The SDI is a four-year project implemented by Save the Children in collaboration with the Lagos State Government. This project is aimed at reducing at least 50 per cent diarrhoea incidence among under five-year-old children in Shomolu LGA and Bariga LCDA. The project seeks to demonstrate the efficacy of the World Health Organisation and WHO/UNICEF recommended seven-point plan for diarrhoea prevention among under five -year-old. Access to quality water supply, improved sanitation and hygiene (WASH) are critical elements of the Seven-point plan. As part of Save The Children’s strategic objective to reduce childhood diarrhoea disease in the communities, 30 water points equipped with treatment plants and solar panels were rehabilitated and constructed in the project communities to support uninterrupted quality water supply in Shomolu LGA and Bariga LCDA. This effort is meant to serve as a model for scale up by the government and elected representatives as a collective effort to improve the quality and access to water available to the community. The essence is to reduce vulnerability to diarrhoea infection. Collaborating with the WASH Advisor, David Atemewalen of the Save The Children Initiative said this project is aimed at removing diarrhoea in the Shomolu community and to achieve this project, “it took us almost a year because we needed the participation, involvement and ownership of the community. Save the Children therefore called upon the government at all levels to replicate and sustain this remarkable effort by using the model water facilities as minimum standard from the SDI to improve access to quality and safe water in the rural areas across the country.